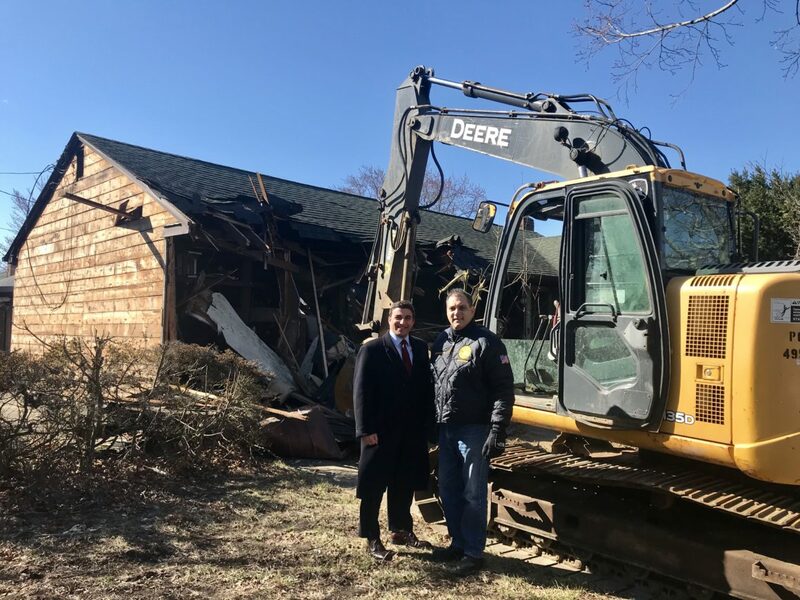 Further demonstrating the Town’s commitment to protecting quality of life in local communities, Town of Oyster Bay Supervisor Joseph Saladino and Councilman Lou Imbroto today joined the Bethpage community in celebrating the demolition of a longtime blight on Warwick Place. The zombie home, whose conditions violated many requirements under Town Code, was taken down with cooperation from the homeowner following a lengthy legal proceeding. The Town’s Code Enforcement Bureau first inspected the property in July 2017 following complaints from neighbors. While awaiting action from the homeowner, the Town continued to monitor the property and perform cleanups as necessary. Last year, the Town was notified that water was coming out of the home, and it was discovered that pipes burst inside the house. The Town received a judge’s order for permission to access the premises last fall, at which time an interior survey was conducted. The Town’s inspection found the home in very poor condition, with extensive interior damage, rotting floors and walls, mold and mildew, as well as rotting trash throughout. A new builder recently purchased the property and agreed to demolish the dwelling as per the conditions outlined in a stipulation of settlement with the Town. To help combat zombie homes in local communities, the Town Board last year approved a comprehensive package of laws that increase the Town’s ability to seek restitution from property owners and lending institutions in violation of Town Code. These new legislations further allow the Town to recover costs associated with maintenance of vacant properties, and also require that a $25,000 trust account must be established when a home enters into foreclosure. Most recently, the Town approved the creation of a mortgage default registry, which adds an additional layer of protection to its existing provisions for properties in foreclosure and holds lending institutions and property owners responsible for any maintenance required on an abandoned or derelict property.